Mississippi’s regional drug task force funding, contingent on the quantity of drug arrests, encourages the indiscriminate use of confidential informants to increase arrest numbers over the quality and public safety impact of the drug cases. Poorly-structured drug laws, limiting the judicial discretion of judges, produce extremely harsh sentences for relatively minor street-level transactions involving small amounts of drugs, coupled with police enforcement strategies focused on producing high volume low-impact arrest numbers pressure defendants to work as informers, even when drug treatment might prove a better public safety option. Black Mississippians are three times more likely than whites to go to prison on drug charges even as drug use rates are largely identical for both groups. The secrecy that shrouds the unchecked use of confidential informants is a practice that invites abuse, undermines the fundamental legitimacy of the criminal justice system and basic social structures in targeted communities. ACLU's two year attempt to secure basic information on the practice, acknowledged by state officials as public files under Mississippi’s Public Record Act, has gone unfulfilled. 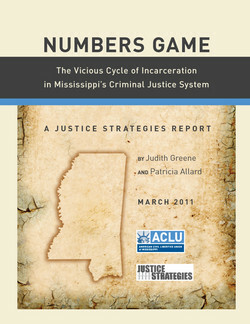 Reform of Mississippi’s harsh drug sentencing laws. Improvements to the effectiveness of federally funded drug task forces. Curbing abuses within the confidential informant system. Establishing safeguards that would protect confidential informants from the real dangers to themselves, their families and acquaintances emanating from their recruitment to work as informants.